The Delegation of the Rector for Strategic Development shows its training activities for 2018. May 25, 2018: Workshop to revitalize meetings and working groups, in charge of the Delegation of the Rector for Strategic Development. 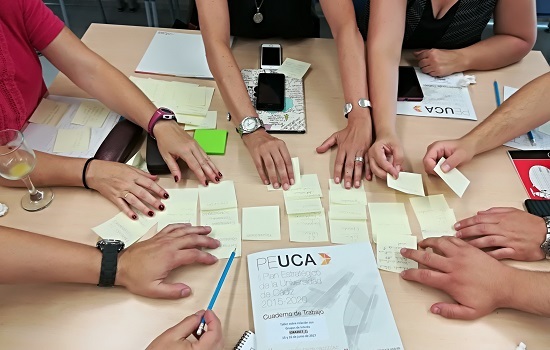 May 30, 2018: Workshop of Introduction to the EFQM management model for Managers, by Nuria Rodríguez from the Develop Group. June 21, 2018: Workshop on the use of the CANVAS tool, under the responsibility of José Manuel Sánchez Vázquez who is a Professor at the University of Cádiz and Coordinator of the Master’s Degree in Business Creation, New Businesses and Innovative Projects. September 14, 2018: Workshop on Rankings, by Francesc Xavier Grau Vidal, who was Rector of the Rovira i Virgili University. Strategic Development Workshop for Managers. Workshop to Support the Management of Academic Positions. New Organizational Structure of the UCA.